It began on a quiet Sunday in Gatlin, Nebraska. That was the day the children slaughtered all the grownups. Isaac, the boy preacher, told them that He Who Walks Behind the Rows was pleased, and three years later the children still follow Isaac and his evil teenage disciple, Malachai. When a young couple traveling cross-country accidentally drive into Gatlin, they begin to discover the town's terrible secrets. However, what they don't realize is that they have become part of the children's bloody mission a mission that cannot be fulfilled until the two intruders are dead. 1992/Color/93 mins. Note: Artwork shown is DVD. 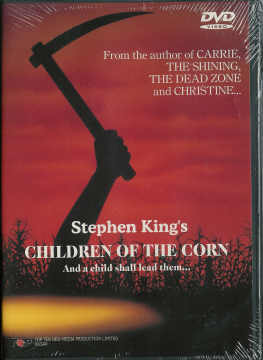 VHS artwork is similar.